I started watching anime because of cool action scenes and interesting characters, but connected to it for many other reasons. One that is particularly meaningful to me is my personal connection to dandere and kuudere moe characters. Critics of anime often dismiss it as a silly medium characterized by ultra-violence and immature fan service. However, I find that the immaturity, for all its problems, can sometimes allow it to break certain rules or norms while pretending not to. One of the fan service-oriented aspects many anime indulge in these days is moe, a kind of cuteness. Moe girls are often classified by personality “types,” including dandere and kuudere, quiet girls who speak very softly, if at all. The former refers to characters who have trouble speaking up because of shyness or social anxiety, while the latter refers to characters who are silent by choice, either because of a lack of emotion or a taciturn personality that isn’t defined by shyness or anxiety. Being non-verbal in real life is not cute. I have an anxiety syndrome called Selective Mutism. This is a deceptive name, since a person affected by it doesn’t have any choice or selection. Rather, it involves an uncontrollable, drastic dampening of one’s personality and ability to express it, including partial or complete mutism. The “selective” part of the syndrome refers to the fact that its symptoms are conditional, as they only appear in situations where the person is feeling socially anxious. One classic example is of a child who is mute and very passive at school, but has a much more active and talkative personality at home with their family. I’ve learned to cope and live with the condition, but still struggle with how it is seen by other people. It’s not so much that being non-verbal isn’t cute, but that it isn’t seen as cute. In fact, most people think it’s pretty weird and unexpected. It is not socially acceptable to be the “silent type” you’ve seen so many times in fiction. In the fantasy spaces of anime, things are quite different. Being non-verbal is a moe asset for a character, a quirk to set them apart from the rest of the cast and attract fans. There’s an element of casual misogyny to this in some series, including Chihayafuru and Guilty Crown, where a loud or active female character is casually told that she would be cuter if she kept her mouth shut, without this notion being questioned by the narrative. Inversely, non-verbal female characters in series such as Rosario+Vampire are described in-universe as a “Yamato Nadeshiko,” the classical Japanese ideal wife, silent and subservient to her husband. But the anime Macross Delta offers a more positive portrayal of a non-verbal kuudere character as a desirable person to be with in the form of Reina Prowler, an idol who fights a deadly virus with the power of singing. Despite being silent and laid-back, Reina becomes a galactic-famous idol whose catchphrase, “Music is love,” emphasizes connections between people. She also has a number of friendly and professional connections, including a romantic relationship with another idol. Contrary to what most people assume of a non-verbal person, she has a sense of humor, and even initiates a rivalry with one of the antagonists because of a prank. In the show’s group scenes among the heroes, she’s usually standing at a slight distance or looking away from the others, yet I never felt like she was being excluded or ignored. Rather, I felt like they were simply accepting her for who she is. Reina may be a bit distant, but that’s just a part of her personality, and the story never portrays her as being cold or lifeless because of it. 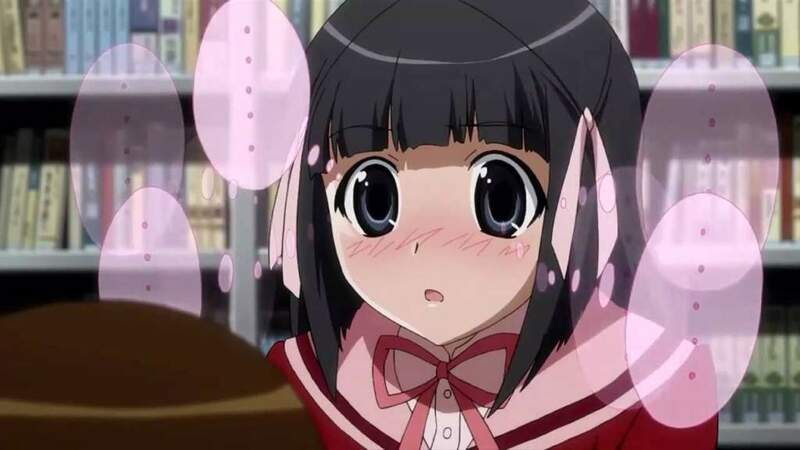 Besides the fantasy of a more accepting world, anime occasionally represents the struggles of non-verbal characters fairly accurately, mainly through the dandere archetype. An early arc of the series The World God Only Knows centers on Shiori Shiomiya, a shy bookworm who is generally fine with being alone with her books, yet still yearns to socialize with other people, as much as she finds herself at odds with them. In the manga, when she stays silent in a moment when she is expected to speak, thought bubbles fill the panel to show how she wants to respond. This appears to be a cute gimmick, but it also represents a very real reaction caused by social anxiety, where one thinks too much about what to say or how to handle the situation, and in the end says nothing. In the same way, she is reluctant to speak loudly. In one flashback scene, she is unable to commit quickly enough to answering a question about her opinion on a TV series. By the time she mentally comes up with a detailed answer, it is way too late to give it anymore. It all hits very close to home for people with social anxiety. Another example, which actually inspired me to write this, is Kunogi from SHIROBAKO, an anime about the anime industry. Kunogi joins the series midway through as a newbie animator and develops an almost daughterly relationship with one of the main characterS, her senior animator Ema. Many fans consider Kunogi to be a fanservice character. They say that she would be annoying to deal with in real life, which makes me worried about how they would react to actual non-verbal people. They also say that the way Kunogi expresses herself with gestures instead of writing things down is unrealistic, which couldn’t be further from the truth. I typically express myself with gestures, even something as simple as nodding or pointing, as long as it removes some of the need to speak. Gestures typically used in verbal conversation—not sign language—possess the unique advantage of not requiring the person to form proper grammar or remember words, so they are useful in situations where anxiety tampers a person’s ability to think fast. Meanwhile, writing down a sentence involves the same mental process as speaking it, so it’s not very useful. By contrast, the manga Komi-san wa Komyushou Desu features the eponymous heroine Komi, an extremely anxious girl who can barely speak a few words to people, but can immediately write down long and coherent sentences in a notebook to show it to people. It’s convenient for the story that Komi does have a way to answer other characters at any moment, but it’s inconsistent with my own experiences. I appreciate Kunogi in Shirobako because she does represent some of my experiences. Sure, her gestures are greatly exaggerated for comedic effect, but that’s in line with the exaggerated atmosphere of Shirobako. Like her, I have expressed myself with gestures when it was difficult to pronounce the words, and like her, I have relied on people I trusted to walk me through a stressful encounter with strangers. On top of that, she also ties into the fantasy described earlier in a way dandere characters rarely do: she represents the hope that even non-verbal people like me can grow and strive in a “cool” industry that requires communicating with your peers. At the end of the day, there’s more value to anime’s silliness than just laughs. As a non-verbal person, it lets me enjoy the fantasy of a world where people casually accept others who speak at their own pace and represents some of the struggles I face as a person affected by severe social anxiety. Unfortunately, I’m often chagrined by fandom’s tendency to look down on non-verbal characters, particularly when they are not the protagonist but one of a cast of exaggerated individuals. Ironically, I find non-verbal characters to be better represented when social anxiety isn’t the main theme of the story, and hence, doesn’t make a big deal of it. There is something more normalizing about a non-verbal character, dandere or kuudere, just being one part of an ensemble of characters on a sci-fi or fantasy adventure. These characters are precious to me for this, and I hope others can consider what they mean to people like me. Suryce is a French non-binary writer who makes narrative games about social anxiety and queer themes. Sometimes, he also remembers that Twitter can be used for other things than retweeting art and rambles on it.